Recently while testing out an Android-based tablet PC (a pretty junior-level gadget from Big Lots; please don't think I've got iPad money) I happened to download a most nerd-tastic conversation on The Double Feature Show online, movie buffs Eric and Michael doing a hilarious, flippant dissection of John Carpenter's THE FOG and Ron Underwood's TREMORS. The pairing seemed pretty much arbitrary, just a drive-in-double-bill kind of thing. Anyway, it was a fun podcast and brought back fond memories of my seeing TREMORS in 1990 (hey, I even had a full-time job back then. Remember those?). TREMORS was an old-school monster movie you could bring mom and dad to (and I did; they were so glad their least profitable child finally had a full-time job, even at $4 an hour no benefits no advancement), and it had the special bonus of hailing from Universal Pictures, a Hollywood creature factory of time-honored distinction. The self-consciously B-grade movie setting of TREMORS is an isolated American trailer-camp desert town known as Perfection, where the population is only 14 - humans, anyway. Some mysterious deaths among the tiny box-canyon community clue in local yokels Valentine (Kevin Bacon) and Earl (Fred Ward) that strange things are afoot, or to be exact, under foot. It seems the vicinity is the feeding ground for a previously undetected species of giant worms - tentacled killer grub-things the size of vans. There is actually some nice bad-science explanation for the creatures offered by the token beautiful lady geologist (yeah, right), that having no bones, such monsters would leave no telltale traces for zoologists either today or in the fossil record. The "graboids," as they are dubbed because they grab prey and drag them underground to eat, tunnel faster than a person can run, and director Ron Underwood and producer Gale Ann Hurd wisely avoided showing them in full most of the time - not because he's an olden-days cheapie director who couldn't afford to, but because the vibe works better that way, even as the bulk of the picture takes place in broad daylight, in defiance of most horror-flick tropes. Cornered, Valentine, Earl and the rest of the citizens must figure out the graboids' weaknesses (they're blind and hunt by sound, for instance) or be devoured. Fortunately a couple of the Perfection residents are a husband-and-wife team of armed survivalists. I'll bet actors Michael Gross and Reba McIntyre became National Rifle Association/Michigan-Ohio Unorganized Militia pinups for this and their showstopper sequence in which they unload their whole ever-escalating gun collection into a single graboid. I think some wise guy said a movie needs at least three great scenes to be a winner. That's one, I'll let you vote on the second, and the climax (with a full-body revelation of a graboid) makes a most satisfying third. 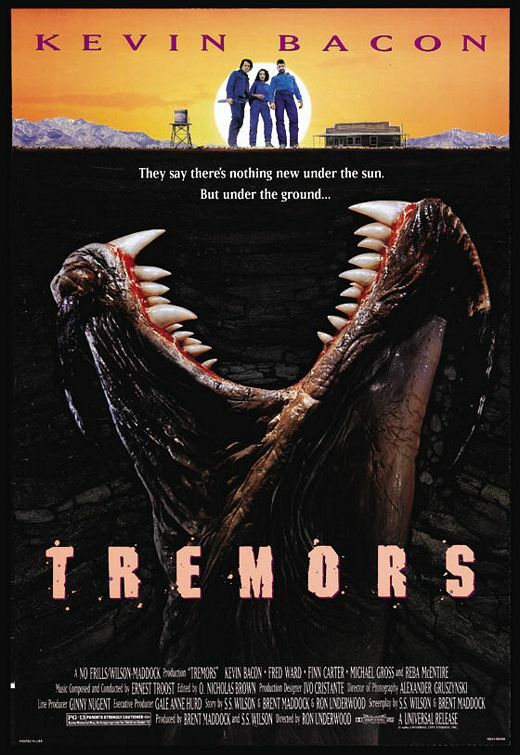 TREMORS is all the more enjoyable for being decidedly lacking in CGI; the graboids are all cool animatrons. And yes, Reba sings the closing theme. Life was kind of fun in 1990. I could log onto Cleveland Freenet at 1200 baud, get my Kodachrome developed affordably, fill my Plymouth Horizon with gas without going broke, and fool myself that a brilliant future lay ahead...Damn, I fear I failed to appreciate the good times while they lasted. But I did appreciate TREMORS as the unpretentious monster show it was. Universal Pictures later cranked out some direct-to-video sequels, in which returning characters fought against other cryptozoological beasties related to (or evolved from) the giant worms, and this time there was cost-cutting CGI. 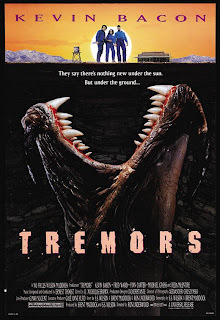 Recently the Sci-Fi Channel, which now calls itself Syfy (Forrest J Ackerman better be rolling over in his grave) did a short-lived TREMORS TV series that ran the whole monster-hunting premise into the ground; how such a concept could have legs is beyond me (and was beyond everyone else, apparently).